Everyone's going on about the Super Bowl. Worried about which team will win, the Denver Broncos or the Seattle Seahawks? The commercials, the food, the whole nine yards (pun intended.) Me, I'm over here on this rainy Groundhog's Day, simply wondering if we're going to go through all of this again tomorrow? Will every day now technically be the day after the Super Bowl, but still the day of the Super Bowl? Will the fans actually now be watching the Super Bowl every single day, thus meaning every day is Super Bowl Sunday? I do not think is a coincidence, and was clearly scheduled by a Football fan. I guess we won't know 'til tomorrow, but either way, I think we should make darn sure that we make the very best of today, in case we have to relive it all over again tomorrow. 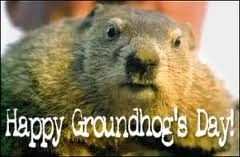 And just throwing this out there, I think the Super Bowl is stealing all the spotlight from that little Groundhog. So, for those of you who don't know yet, Punxsutawney Phil saw his shadow today, therefore confirming six more weeks of winter. Truthfully, I think we all saw that coming.